Chris Moore, SLC’s Managing Director, gave a presentation and workshop at the AISLi AGM and Workshop on March 22nd. 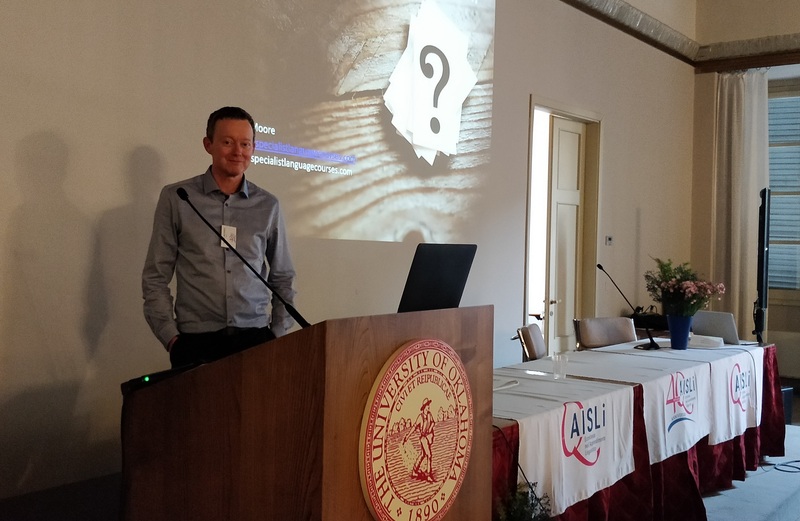 AISLi, the national association set up to ensure high levels of quality assurance among language schools in Italy, was celebrating its 40th birthday in Arezzo, a beautiful town in the heart of Tuscany. It was an honour to have been invited to such as prestigious event with so many school directors present. Chris’ presentation was on developing fluid but coherent strategy in what for many are very unpredictable times for the language learning sector. The session built on the one he gave at the EAQUALS 2018 annual conference in Prague and was then further refined by working with schools at the EAQUALS Training for Excellence event in Edinburgh later in the year. Chris’ workshop was on how schools can use the Business Canvas Model to map out how they can effectively develop and implement a growth opportunity for the business. The Business Model Canvas, a one-page visual document, is a tool created by Alex Osterwalder and the Strategyzer team and used by organisations around the world, from start ups to international corporations. Following Chris’ direction, participants identified potential opportunities for their schools on a blank canvas and then completed it with constituent parts, so working on articulating the target customer, the value proposition, the potential revenues and the potential costs. It’ll be interesting to see what happens as a result. Perhaps at next year’s AGM? The feedback was very positive and Chris was also able to spend time talking with participants over dinner, discovering more about the Italian market. One interesting point from an SLC perspective was the number of schools now looking at putting on Occupational English Test (OET) preparation courses and delivering OET tests. As SLC’s OET portfolio now covers so many aspects of programme delivery, from assessment to study materials to tuition to teacher training, we are hoping to establish a new partnership or two. To get a copy of Chris Moore’s presentations, contact him on chris@specialistlanguagecourses.com.